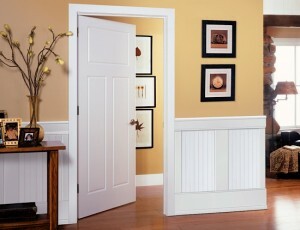 Beadboard paneling is definitely my favorite interior decoration style to for my home. I don’t know if you all of you feel it too, but whenever I enter a home with panels I always feel a warm welcome. I am always drawn to the house even if it’s my first time entering. There is just something about panels that gives me a certain level of comfort and coziness. Paneling has been used to decorate many homes for so many years now and it has actually been used as decoration to many parts and rooms. From walls to ceilings to even kitchen cabinets – you have seen them with panels. Nowadays, furniture has also been creatively decorated with panels too! Now you can take the country and shabby-chic vibe of your home to the next level. Here are some suggested furniture pieces that would go so well with panel decorations. Some beds do not come with headboards. If that is the case of your bed, then you have all the freedom in the world to choose whatever headboard you want to accentuate your bed with. I suggest that you go for panels used as a headboard to make the aura of your room more comfy. I swear, it can make a huge difference! It will help make your sleep more comfortable and relaxing even if your house is located at the heart of a metropolitan city. Cut the panels and shape it according to the size and shape of your bed. Paint it and stain it with colors that coordinate well with the theme of your room as well as with the furniture. Then, you can nail the panels or glue it behind your bed to secure it in place. Bookcases can also make your home feel a bit library-like and it can might take away the feeling of comfort and coziness from your home. So, to combat such feeling, installing some panels along the lines of your bookcase can make it feel more in harmony with your home. You can install the panels in the interiors of the bookcase to create a more country-style cabinet looking bookcase which can also give an aura of comfort. Paint it a different and contrasting color than the exterior for added depth and warmth to your bookcase. But don’t go too bold. 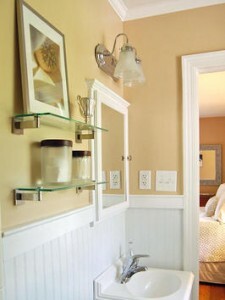 I suggest using warm and earth-tone colors or even white to stick to the country-style appeal. If you have a large bathtub, then I envy you! But you can take that to the next level. You can use panels to accentuate your bathtub which would also add a cozier feeling to your bathroom. Some bathtubs are already lined with tiles and acrylic but I suggest switching to panels. This adds a more comforting aura to your bathtub to help you relax more. It makes the bathtub look like a sauna tub which never fails to exude a relaxing vibe. Panels are a great way to accentuate any home. If God well permit me, I will panel my entire house! But that will be redundant, wouldn’t it? Adding beadboard paneling to your furniture can give a subtle yet impactful hint of comfort and relaxation to make your home more welcoming and warm.